Synopsis: A gifted rider in a world where ladies never race, Maggie Linden is determined that her horse will become a champion. But the one man who could help her has vowed to stay away from thoroughbred racing forever. This was the first Tamera Alexander book I've read and I thoroughly enjoyed it. In this novel, she takes readers to the American South where horse breeding and horse racing is a major part of the culture. The characters are brilliantly portrayed. As a horse afficionado and having owned several show horses, I loved the connection with these beautiful creatures. The plot is strong and multi-layered. There was plenty going on to keep me engrossed and turning the pages. I especially enjoyed the main characters, Cullen McGrath and Maggie Linden, who are people of high moral fibre with strong beliefs. I enjoyed how these characters grew closer together as the story progressed. The author's writing is so seamless yet detailed that it is easily envisioned in one's mind. 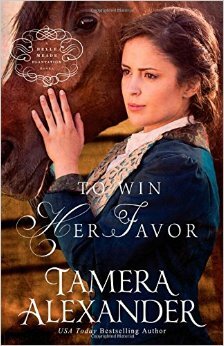 Definitely talented, Tamera Alexander knows how to spin a good yarn, one the captivates, while putting the main characters through conflict. Discrimination and prejudice are also minor themes tackled in this book. It is a book that warms the heart, solidifies our personal convictions, and definitely entertains. Highly recommended! I'll definitely be reading more from this author.